Tamashima factory has the cutting edge equipment and skilled craftsmen. We have introduced the latest facilities at our Tamashima factory, including high-precision CNC blade milling machines, high-technology propeller overturning machines and internet-of-things (IoT) sensors, all of which improve efficiency and ensure safety at the plant. 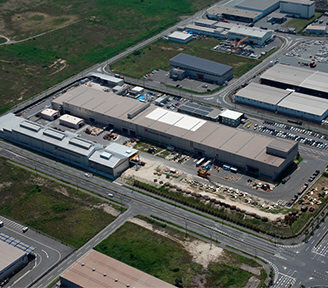 Nakashima Propeller combines the latest facilities and the technique of a superior craftsman to produce highly accurate and optimised propellers for customers. Maximum cast weight: 185t. We manufacture approximately 12,000 t of cast products per year, and can boast of having the No. 1 share of this type of products in Japan. This manufacturing method does not require a prototype mold and makes single products in one step. By this method, manufacturing with shorter delivery will be possible. 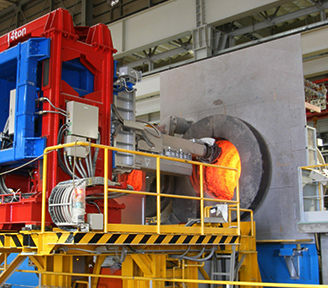 60 t low-frequency electric furnaceThis is the largest low-frequency electric furnace for copper alloy castings in Japan. 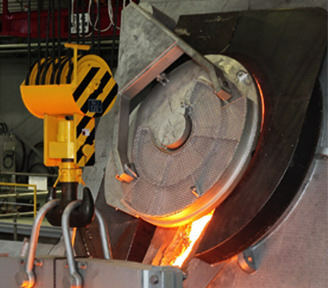 Analyzing our past casting procedures enables us to achieve high quality and efficient castings. Original molding methodsOur original molding methods allow us to mold casting quickly, resulting in short delivery times. 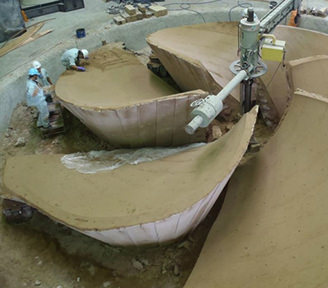 After receiving propeller drawings, Nakashima can complete a 6m diameter propeller mold in 2 weeks in the shortest. Casting solidification analysis systemIn order to manufacture a cast product as large as 135t without defects, Nakashima use a casting solidification analysis system and carry out thorough simulations as a preliminary confirmation of quality. Reverse mega propellers in just 3 minutes. 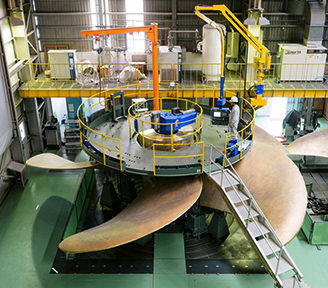 Nakashima can produce propellers in a variety of sizes, up to a total weight of 135t. Although moving such a heavy product safely is not easy, the product must be flipped over at least four times during the manufacturing process. 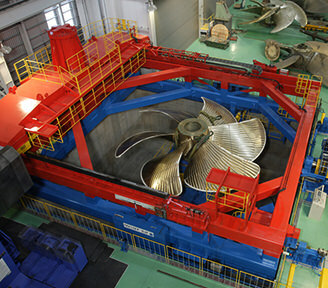 Nakashima has a custom-built propeller overturning machine that reverses a 135t propeller in only 3 minutes. This machine has caused no accidents in the 10 years since its introduction. The site where the casting operation is carried out experiences harsh operating conditions. Cleaning the inside of the electric furnace requires heating up to 1000°C and has so far been carried out manually with small-scale torches. We have developed custom slag-removal equipment that allows us to clean the furnace quickly after each operation to extend the life of the equipment and reduce its environmental impact. 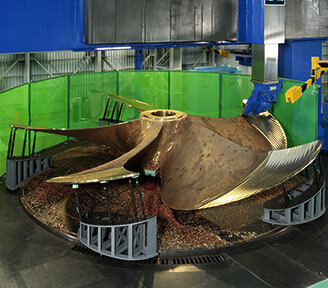 Propeller overturning machineUsing our unique propeller overturning machine, it can reverse a propeller weighing as much as 135t safely, without damaging it. Blade surface processing machineThe blade surface processing machine is essential equipment in creating a propeller that matches the design specifications and drawings. In 1974, we installed a 5-axis blade surface processing machine that is CAM controlled by our proprietary program. We have been able to produce more than 400 propellers per year. 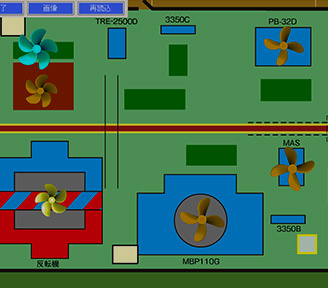 This is an IoT factory that achieves both mass production and high performance. Our Tamashima factory, which is the main plant for large propellers, manufactures more than 400 propellers annually, and it was built in 2005. Our custom product management system integrates information from management and production facilities. Some instruments are managed with online information, such as machine operation status, demand monitoring and our original horizontal balancing system. We analyse daily calibration information for each measuring instrument to maintain accuracy and improve manufacturing tolerances. Tamashima factoryThe Tamashima factory started operation in 2006 and manufactured 3640 propellers with a total weight of 100,000 tons in the first 10 years. Currently, it manages production using IoT and stably produces more than 400 units annually. Proprietary bossing machineThis is our proprietary NC processing machine that cuts propeller bosses. The processing data is linked to the information on the design drawings, making it possible for workers to process bosses using a single management system without needing to enter a separate program for each job. Production management systemWe employed our proprietary production control system to implement real-time product location awareness, track man-hours, and produce a daily inventory. This system manages various manufacturing information fed from sensors and can handle big data.